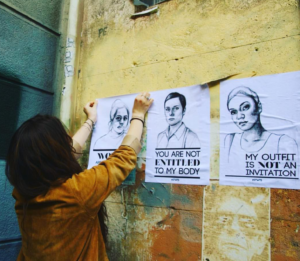 This week, activists, preventionists, advocates, and people all over the world make their power known during the International Anti-Street Harassment Week. Stop Street Harassment, along with RALIANCE and the UC San Diego Center on Gender Equity and Health, found in a 2018 study that across the U.S., 81% of women and 43% of men have experienced some form of sexual harassment and/or sexual assault. Seventy-seven percent of women and 34% of men experienced verbal sexual harassment. Street harassment is pervasive, invasive, and preventable. Public spaces are often the first place and the most frequent place that people experience sexual harassment, and experiencing sexual harassment or street harassment can cause anxiety or can cause someone to change the route or routine in hopes of avoiding future experiences. The same norms that uphold sexual and intimate partner violence (harmful masculine norms, systemic oppression, patriarchy, and power over others) are the same norms that make street harassment so common. Prevention shouldn’t be the burden of those who have experienced harassment; rather, it takes everyone in a community to prevent harassment and change social norms to ones that promote safety. This week is all about mobilizing to end street harassment. Just like sexual and intimate partner violence, prevention isn’t isolated to one strategy. Preventing street harassment ranges from intervening when witnessing harassment against others to advocating for and designing city and public spaces with those more vulnerable to harassment making decisions. Read more here from Stop Street Harassment on ways to get involved this week.